Should I call it Kashi or Banaras or Varanasi? Does it matter? Yes, it matters. But outcome of the approach here is converging rather than diverging, something that doesn't happen normally. Different names given to any entity pertain to different traits and particulars of that entity and so signify divergence of shades it acquires in the process of evolution. In case of Banaras, all three names signify just one thing – the ‘light’ of eternity! 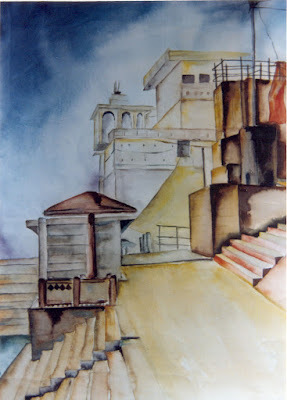 ‘Kasa’, the origin of 'Kashi' brings ‘illumination’ in the literal sense and it has percolated to realms of realization with spiritual antiquity of civilization inhabiting this part of the world illuminating the other world with its spirituality and wisdom; Varanasi, which signifies again the two ancient notions, a river and a place, along the sacred eternal Ganges, a symbiosis of eternity; then comes the ‘Banaras’, which signifies the culture of the city, indicative of its moods, an ingrained tinge of aloofness creating a paradox of ‘not so careful’ as well as ‘sensitive to the core’ way of thinking as a way of life. Interestingly one popular meaning of Banaras is combination of 'Bana' (readymade) and Ras (juice) which symbolically means an always prevailing presence of Life Form, much in line of its place as one of the oldest continually inhabited cities. But can we define a place like Varanasi? I don’t think it would be a feasible aspect of analysis even for a discernible thinker, not only with Varanasi, but with any place that has a history to tell like it has. So the best definition would be ‘it can’t be defined’. Rather it’s a journey which we live every moment and when we dig in to know more, the path to know a bit more of it presents before us many of its unseen facets through its thousands pasts. Like knowing self, it’s a never ending process. I don’t know Banaras much even after spending 25 years of my life there. Welcome to Varanasi, the city of eternal flow of Ganges, ghats, temples, lanes, Banarasi Saree, Banarasi Paan, Banarasi Lassi, Ganga Aarti, Spiritual Discourses; Saarnath and Buddhism, a city of packed crowds.. Welcome to Varanasi, the city of polluted eternal flow mixed with sewage; ghats with dumped wastages; most temples with with anything but spiritual priests; narrow dirty lanes; dying business of Banarasi Saree tradition; a city that is educational; hub of the region; a city with highest rate of crime in the region.. Welcome to Varanasi, a city of paradoxes, a city of symbolism, a city of assimilation, a city of doom, a city of resurrection..
All these notions have co-existed and will co-exist. 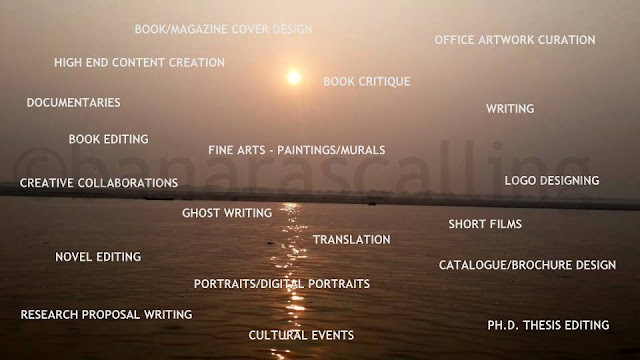 Varanasi is a place inheriting all these ingredients of antiquity, of not so remote past, of present and is in the process of absorbing the incumbent constituents for its future. Mark Twain had observed: "Banaras is older than history, older than tradition, older even than legend, and looks twice as old as all of them put together. The city is reminiscent of a preservative transition. But the transition of the day is something that is still hanging off the balance to find a proper modifying character that can equal its long history of convergence of spiritual themes. The city has a history of its own and certainly for such a mix of cultural ethos, the evolution becomes more about assimilating the new in old rather than a total metamorphosis of the old with the changing times. Banaras of the day is more a city of crowd. The over 30 lakh populated city has grown rather irregularly. It has grown vertically. The missing horizontal component stops it to have a flare of growth of contemporary times that could be in tune with its eternal character. It has misspelt its physical, metaphysical, spiritual, ethical and metaethical components. It makes us feel sometimes it is lagging in the race to catch the fast rotating wheel of time, but probably it is the saving grace that would ultimately prevail to preserve a fine balance of tradition and modernity. But as we cannot define Banaras, we cannot define its evolution. All through its period of existence, it has found ways to maintain its identity and it will do the same now and ever as it has been doing in the past. The city has an indomitable character well seen by the world after 2006 blasts, the one ironic incident which has placed it in eyes of the media players. What a way to perceived glory!